Above, notice the slaves dropping off the bow onto the beach; their captors probably hoped to chase them into the bush to avoid seizure by the British. The British seamen left the London, a fully rigged warship, to attack the dhow and, if lucky, board it and take charge—a dangerous business. In fact, on December 3, 1881, when the London again came upon a dhow, one with some hundred slaves aboard, its captain, Charles J. Brownrigg, led a boarding party to free the slaves and was himself killed. 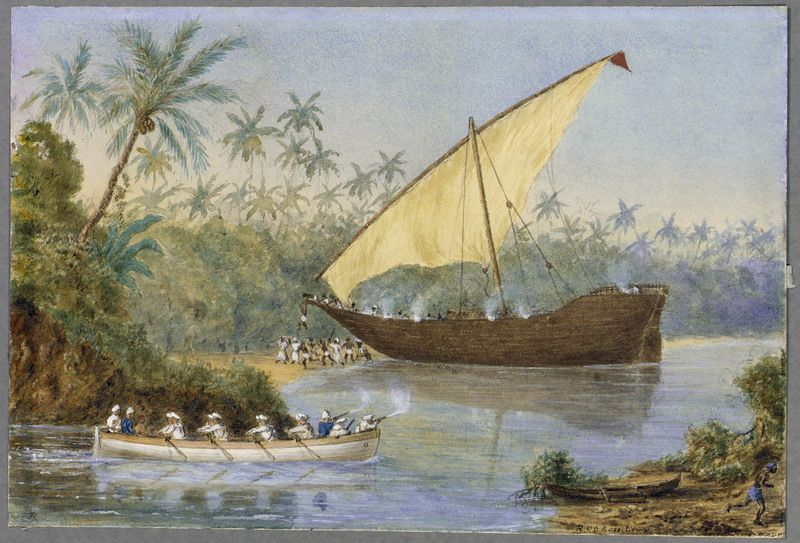 A few years later, in 1880, while patrolling the the waters off the coast of Tanzania, the London intercepted another dhow and took its cargo aboard. The slavers may have picked up their merchandise at Kilwa, a Portuguese port on the coast of Tanzania, intending to deliver it to the huge weekly slave market on Zanzibar. 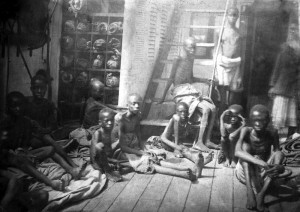 “Slaves and their captors on the deck of H.M.S. London.”  Had they not been rescued, these gaunt men, women, and children would have been confined in Zanzibar’s “barracoons,” fattened up for a few weeks, and then put out for sale. 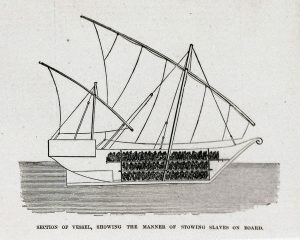 The deplorable condition of some of these poor wretches, crammed into a small dhow, surpasses all description; on the bottom of the dhow was a pile of stones as ballast, and on these stones, without even a mat, were twenty-three women huddled together—one or two with infants in their arms—these women were literally doubled up, there being no room to sit erect; on a bamboo deck, about three feet above the keep, were forty-eight men, crowded together in the same way, and on another deck above this were fifty-three children. Some of the slaves were in the last stages of starvation and dysentery. The Arab Slave Trade peaked in the 18th and 19th centuries, but it began in the 8th century with the Arab invasion of north Africa and extended into the first decades of the 20th century. There were three main branches. 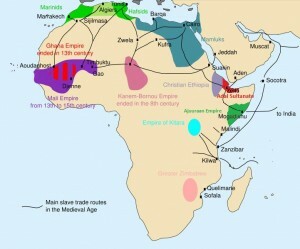 The trans-Saharan route ran from northern Nigeria or Timbuktu to Tunis or Tripoli, carrying gold, ivory, and slaves seized from sub-Saharan, unconverted (non-Islamic) communities—an estimated 3.5 to 4 million over a 12-century period. Another route ran along the shores of the Red Sea carrying slaves from Muslim kingdoms in southern Sudan and the Christian kingdom in Ethiopia to Red Sea ports. At the end of the 18th century, Darfur was sending 5,000 to 6,000 slaves a year along this route. One scholar guessed that between 12 million and 15 million passed through Cairo in the 16th century. Finally, the Indian Ocean route began on the east coast and ended at ports on the Persian Gulf, transporting slaves to the Arabian peninsula and the Middle East, with some going to India and even Indonesia or China. How many slaves did the Arab trade account for between the 8th and 20th centuries? Impossible to say, given the absence of records for most of the period. Estimates by scholars range widely from over 8 million to 25 million. For comparison, the Atlantic trade, which flourished between the 16th and 19th centuries, is said to have involved 12.5 million slaves. Check back for Part III, the conclusion to this series, on Friday. National Maritime Museum, Greenwich, London, Michael Graham-Stewart Slavery Collection. Acquired with the assistance of the Heritage Lottery Fund. ZBA2738 Artist: Reverand Robert O’Donelon. Ross-Lewin was chaplain aboard HMS ‘London’ in 1876-77. Robert J. Blyth, Britain, the Royal Navy and the Suppression of the Slave Trade in the Nineteenth Century (Aldershot, England:Lund humphries; London: in association sith the National Maritime Museum, 2007). http://Zanzibarhistory.org; This website has a large collection of historic photographs of Zanzibar. This picture was published in the London Illustrated News on March 1, 1873. G. L. Sulivan, Dhow Chasing in Zanzibar Waters and on the Eastern Coast of Africa (London: Frank Bass & Co., Ltd, 1968) 168. First edition, 1873. The photograph was taken by the author and is in the collection of The National Archives of the UK. Paul Obiyo Mbanaso Njemanze, “Slavery, Abolition of: East and West Africa,” Kevin Shillington, ed., Encyclopedia of African History 3 (New York: Fitzroy Dearborn, 2005), 1387-1389. Martin A. Klein, “Slavery: Mediterranean, Red Sea, Indian Ocean,” Kevin Shillington, ed., Encyclopedia of African History 3 (New York: Fitzroy Dearborn, 2005), 1382-1384. Onwuka N. Njoku, “Slavery: Trans-Saharan Trade” Kevin Shillington, ed., Encyclopedia of African History 3 (New York: Fitzroy Dearborn, 2005), 1384-1386. Very in depth, leaves you in shock at horrors. David Livingstone wanted to start a trade system with Africa and the world. He realized that slavory ruined lives. He stopped the slave trade with trading natural resources. Sorry to be pedantic but the slaves are being dropped off at the bow or ‘stem’ of the dhow not the ‘stern’ (1st picture caption). The ‘stern’ is the back of the slavers’ boat where the rudder is clearly seen. Excellent informative article, thank you. Thank you for the correction, Nigel! Duly noted and edited. Sir, I’m sorry, but you are not well informed. It happens that the Portuguese left the fort they have built in Kilwa in 1512, and at the time of Dr. Livingstone there were no portuguese there for about 3 centuries. It was the Oman sultanate who was ruling. Please, stop slandering the portuguese and start doing a honnest work!